It's widely known that vitamin D works in conjunction with calcium to build strong bones, but new evidence strengthens the understanding of the nutrient's effect on other body systems, as well. Researchers from Creighton University, GrassrootsHealth, Pure North S'Energy Foundation (PNSF) and the University of Alberta hope their new findings about the nutrient will lead to improved governmental nutritional policies. Led by Robert P. Heaney, M.D., John A. Creighton University Professor at Creighton University and research director at GrassrootsHealth, the research team joined efforts to refine known associations of vitamin D with insulin resistance, a precursor to type 2 diabetes mellitus, and blood pressure. While insufficient vitamin D has long been associated with increased insulin resistance and hypertension, this study is the first to prove that the relationship is not linear or consistent across the full range of vitamin D status. Instead, it identifies a specific range where the association is strongest: 16-36 ng/ml (40-90 nmol/L) of 25-hydroxyvitamin D, the blood measurement of vitamin D status. Furthermore, the results suggest that a level of at least 32 ng/ml (80 nmol/L) must be achieved to ensure small but useful improvements in both blood sugar control and blood pressure. "It's important to recognize the range at which any substance is effective," explains Heaney. "At low intakes, a given increment will do little more than prime the pump; and at high levels, the effect is already realized so giving more does little or nothing. Only increments in intake above a certain basal status will produce a detectable effect." 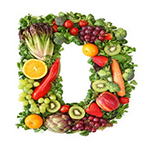 This study was also the first to apply a method of analysis that reflects the basic character of vitamin D as a nutrient. After taking into account influential factors like body mass index (BMI) and waist circumference, the relationship between vitamin D status and insulin resistance and blood pressure was analyzed in incremental sections from the lowest to the highest levels. "It's only by applying this unique method and analyzing many subsections that we can see the real nature of the relationship," said Heaney. Researchers were supported by funding from Pure North S'Energy Foundation. The findings were published in the May issue of Advances in Nutrition and are available as an open access publication.